Although the final nominations have not yet been published in the election for constituency representatives on Labour’s national executive, the left moved into a decisive lead this week. Although nominations, most of which have been made by constituency delegates elected prior to the Corbyn surge of last summer, are likely to understate the left’s support in an OMOV election, left candidates still occupy 6 out of the top eight places and seem likely on this showing to win at least 5 of the 6 places available. Johanna Baxter, who was in second place for nominations in 2014 as an independent, looks likely to lose her place, though she is now backed by both right-wing organisations Labour First and Progress. The left’s Christine Shawcroft is back in 2nd place having been in sixth place last time, followed by Pete Willsman of the Campaign for Labour Party Democracy in the highest place he has ever achieved, up one place from 2014. Ellie Reeves, who probably benefitted by not being supported by Progress in 2014, has risen to fourth place with their support this time but still cannot be certain of a place – Pete Willsman finished 7th having been 4th in nominations last time and only got onto the NEC because Kate Osamor was elected as an MP. Nice to have some good news. Unfortunately a section of the PLP appear to have taken leave of their senses. I would urge everybody to sign that petition and then write to a Labour MP and urge him/her to support Corbyn. 8,000 messages of support for Corbyn to each Labour MP should put a stop to this nonsense. As for those who have resigned, good riddance to the lot of them! I hope that they face a selection challenge in their constituencies. The hypocrisy of these people is breathtaking. Corbyn is blamed for not winning the Euro referendum. But one person who has not received any criticism at all is Gisele Stuart MP who was one of the most prominent Brexiters. And let us not forget Stephen Kinnock. Has he not forgotten how long his useless father was allowed to stay on as Labour leader? He stayed on even after the disastrous 1987 election where he barely improved on 1983. The Conservative election poster came about because Kinnock had never seriously made the case for Britain abandoning its nuclear weapons. We now know that he never actually supported that policy at all. As a result, he faced a question from David Frost. Instead of challenging the ridiculous nature of the question, Kinnock accepted the logic of it and the Conservatives then responded with those posters. Even then, Kinnock made absolutely no effort to challenge such nonsense. As for Bernie Grant, he did not actually approve of the policeman being killed. Assuming the he actually said the words that are attributed to him, it is perfectly possible to interpret them as a statement of belief (not a statement of approval). I trust this answers your question. Some of those listed as right aren’t too bad eg Ellie on Colombia has been great. 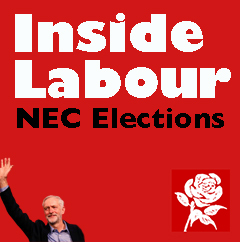 However, we need to be sure that the NEC supports Jeremy – vote left all the way from me. Which is partly why the coup is taking place now : the plotters know that a successful challenge will be more difficult once the NEC has shifted decisively to the left and Conference has put democratic safeguards in place . Where are the final nominations? why do they take so long to add the remaining CLPs? is the Labour staff too busy right now? The sun is at last shining on the righteous(ie the CLGA Slate).I am now well ahead of Fixer-Luke,despite him appearing on LabourList more times than I’ve had hot dinners.It is really good that F-L is well behind our Rhea,given that he said Rhea was cheating. Yes I am supporting all the Left 6! By the way the Right in Labour with the support of the media tomorrow are to launch their latest attack saying ordinary members across the country are not happy with Jeremy. Make no mistake as socialists this is the fight of our lives for a potential Socialist Government under Jeremy. Brothers and sisters now is the time for all good socialists to come to the aid of Jeremy! Oh and as a white working class socialist can I say a lovely Asian male friend of mine told me he joined Labour because of Jeremy. He also told me to tell you all that with the massive increase in members that Jeremy has brought in he has brought in millions of pounds for Labour! Can you imagine any of these Right wing Labour cretins like Benn et al being able to do that? Stand firm brothers and sisters and stand firm Jeremy – we are up against nonentities! These MPs are making the case for mandatory re-selection.